Sweet or salted? That’s the question. Go to any cinema (translation: movie theater) in the UK and you’ll inevitably encounter the two opposing popcorn types: Sweet (which is similar to Kettle Corn) and salted (which is like our regular popcorn, minus the butter). Butter, at least the last time I went to the cinema in the UK, was not a big factor in the popcorn wars and maybe things have changed since then. Personally, I’m all about the sweet. It’s quite refreshing these days when I spot a theater in the US that serves Kettle Corn as an alternative to the hot buttered sodium fest (not that that’s a bad thing). It’s still too few and far between. So are you on Team Sweet or Team Salted? 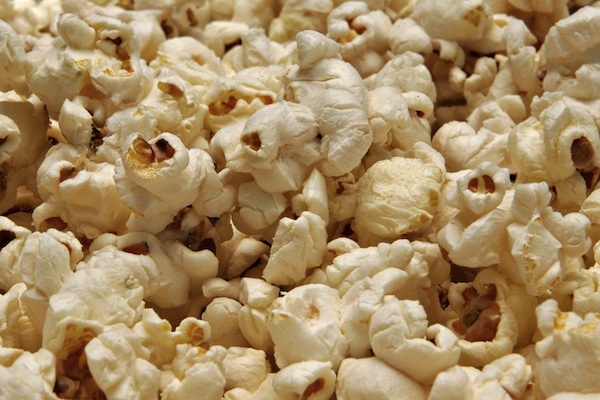 Posted on 23, August 2011, in Culture, Food and tagged British, cinema, food, popcorn. Bookmark the permalink. 5 Comments. I’m with you and cinema outings in NZ are always cast in a shadow of disappointment that there’s no sweet popcorn….. And an element of doubt that I’m upstairs in a mall that looks like it’s being held together with duct tape. And was that a quake or the rumble of the posh screening next door…. If I’d had sweet popcorn I’d have happily been munching away. I also like to throw the odd bit of sweet in my friends salted. They never notice you doing it and it always has a comedy result. No sweet popcorn in NZ?! I had no idea! I will admit to enjoying candy mixed into my popcorn. Actually in Hawaii they do that kind of thing a lot – salted and sweet dried plum seeds, which sounds really disgusting but is really nice, especially when mixed with popcorn. But I do like the combo of sweet and salted together! I adore sweet popcorn (wish I could still eat it, last couple of times it took out fillings and my dentist was not amused!) and have probably only had the salted version once or twice. Wasn’t impressed. The popcorn that I associate with the cinema is the kind that has a sort of toffee-coating, rather than just sugar. Have you ever had the odd kind that’s pink or yellow and is very candy-like? Yes, I have tried the pink kind but not for years and years. I do enjoy that toffee-coated popcorn. Americans typically make that kind of popcorn into balls.